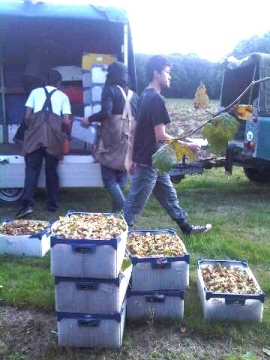 Once again, harvest time is upon us and we will be very busy for the next 5 weeks or so, picking the cobnuts. It creates a lovely rural scene, and the atmosphere in the orchards is one of peace and tranquility, as the nuts are collected. Most of them have dropped by picking time, and are collected from the ground rather than from the tree. At the end of each day, the brightly coloured boxes of cobnuts are brought back to the farm, to be de-husked, cleaned and sorted. Fresh cobnuts are a seasonal treat only available for a few short weeks, and if you wish to experience these, do order them as soon as possible, as before long we will start to dry them, in order to retain the flavour and allow them to be stored, ready for Christmas. As a freshly picked (green) nut, cobnuts are juicy and crunchy. If you want to try the fresh ones you need to place your orders soon ! 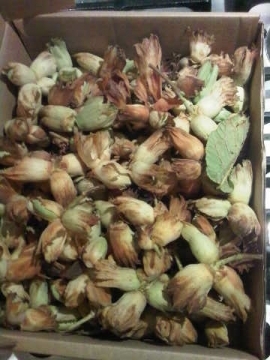 Most of our cobnuts are dried, so they can be enjoyed over a longer period than fresh cobnuts. These dried nuts will be available in major supermarkets in time for Christmas. We have discovered that (with the exception of Christmas) our customers are not too keen on shelling the nuts themselves, so Mr Dain has designed and developed a nut cracking and shelling machine. Once the shells are removed, the nut kernels can be pressed for Cobnut Oil. We believe that we have facilitated the resurgence of a tradition which was common in mediaeval times but has lapsed over recent generations. Also known as hazelnuts or philberts (as mentioned by Shakespeare in 'The Tempest') cobnuts were part of the staple diet of many of our ancestors, and as recently as the 1800s were pressed for oil. Healthy, delicious and produced from one of the most ancient natural foods in the UK, Cobnut Oil is back ! 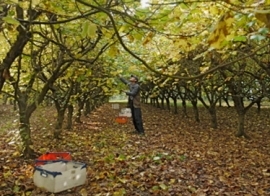 Producing Cobnut Oil is a time-consuming and labour-intensive exercise. Each of our 10,800 trees will yield around 3 kilos of Cobnuts. Having picked the cobnuts, they are then de-husked, cleaned and sorted. This reduces our yield by approximately 12%, so our 3 kilos are now just over 2.5 kilos. We then dry the cobnuts, which enhances the flavour and preserves the flavour of the nut for several months. With 30% reduction in weight after drying, we now have 1.6 kilos of dried nuts, in shells. If we wish to press the nuts for oil, we have to crack the shells, and remove the kernels. This is a 2-stage process, and takes a considerable time. After shelling we are left with 50% of the dried weight – so we now have 800 grams of dried cobnut kernels remaining of our original yield of 3 kilos off the tree. When pressed for oil, 800gm of kernels will produce approx 350mls of oil – just over a bottle and a half. So from each tree, we achieve just over a bottle and a half of pure, intense, golden, Kentish Cobnut Oil. It is a very special product.